I’m catching up, so I hope you’re sitting comfortably, it’s gonna be a long one, but I’ll try not to bore you! I started out later than hoped because the drying room had failed to dry my laundry – grrr – in the end I just put on some damp clothes and left. On the path I was passing and being passed by runners and at Tintagel there was a race gazebo so I enquired as the the race. 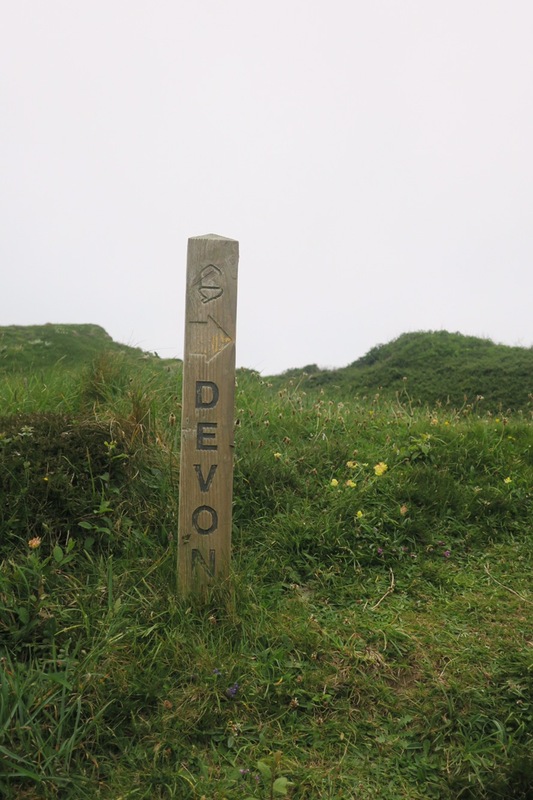 It turns out that they were doing a) 10mile, b) 40mile or c) 24hr endurance races along the coast path – mental! Just 12 runners entered the 24hr race which involved runnning the same 8 miles and few hundred steps over and over. 18hrs in and only 9 remained with the leading having completed 55miles! Respect! 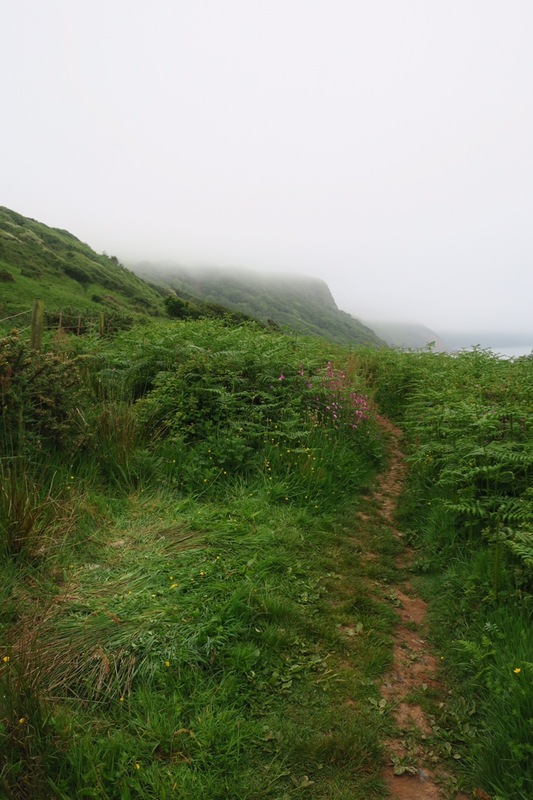 There were a couple of early showers but I cracked on along the South West Coast Path (SWCP). En route at a strategically placed bench I met Wendy English – a lovely and exceedingly fit 81 yr old lady with a backpack(!) who was a career advisor at the University of London, after a quick chat we went on our respective ways and her parting shot was ‘I hope you find the perfect job!’. 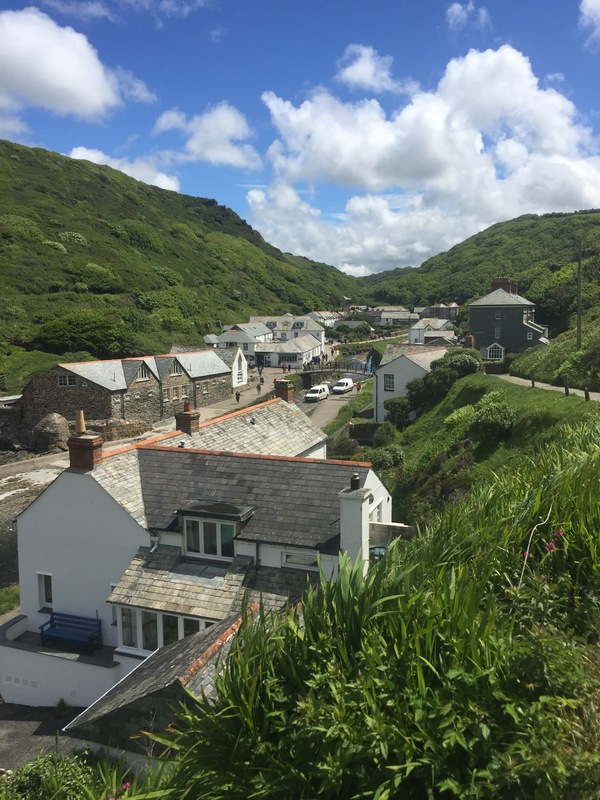 At Boscastle, it was a bit strange to walk around the corner and see somewhere in the flesh that I remember so vividly from news reports. The flood was 13 years ago now and you would never have known that it had happened. The buildings, bridge and river banks were rebuilt and now look well established. Just as I set off from Boscastle, post coffee, a biscuit and a restock, I bumped into Ronnie and Julie munching on their lunch. So I stopped, had my lunch too and then we set off together towards Crackington Haven skipping out a couple of the ups and downs. 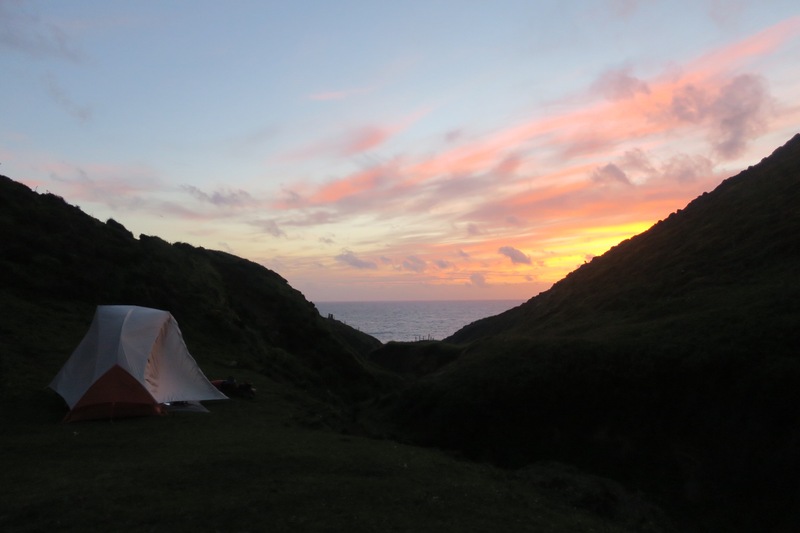 Ronnie and Julie were planning to wild camp and were happy for me to join them, so we pushed on for another couple of miles and found a great little spot called ‘Mot’s Hole’ at SX159985 where we ate, watched the sunset and went to bed. We packed up and set off at a reasonable time and it was straight up out of our camp spot and onto the cliff tops. We stuck to the SWCP all day. Along the way we spotted a couple of beautiful holidays cottages, this was a particular favourite down in Millook. It might look like much but it’s clearly old and been lovingly restored to a very high specification. But at £3,500 for a week we decided not to blow our collective budgets to stay and we set off towards Bude. 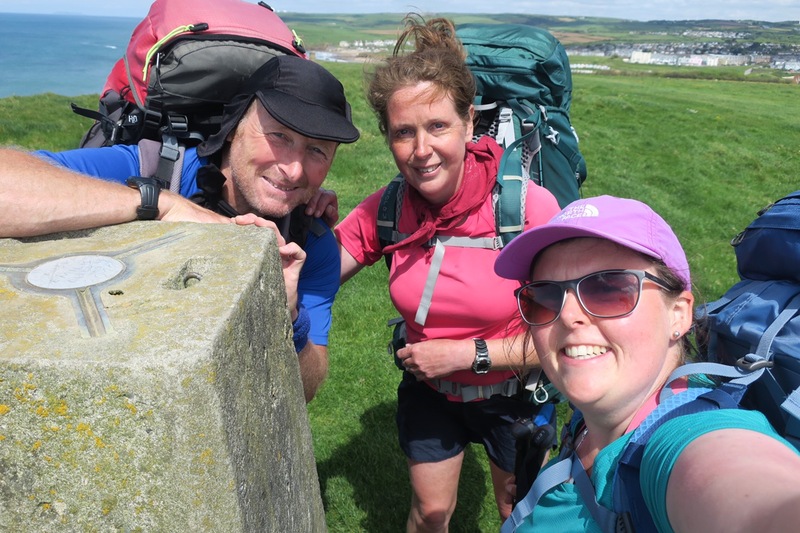 We passed through Widemouth Bay and up to a couple of trig points. On the approach to Bude I remembered that a parcel I posted to myself was waiting for me, but it was Sunday so the post office would be closed, d’oh! Ah well, I’d have to wait it out in Bude until the following morning. I said goodbye to Ronnie and Julie again, got some fish and chips and went to the pub to watch the last day of the premier league unfold – unfortunately not in the Gunners’ favour. 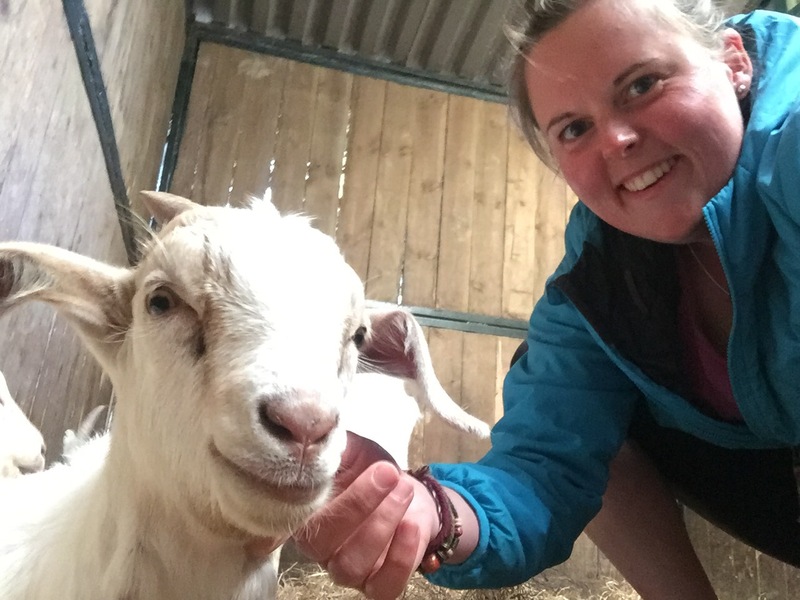 I camped at an Eco Park so that I could play with the goats, so that I did! There were a pair of kids which I nicknamed Ronnie and Julie 😜. I headed straight to the Post Office, took out a couple of items and posted the rest home – as I hadn’t missed any of it. Hit the SWCP heading past a large GCHQ communications station and then a path closure forced me inland past a nice little tea room, which I couldn’t resist. 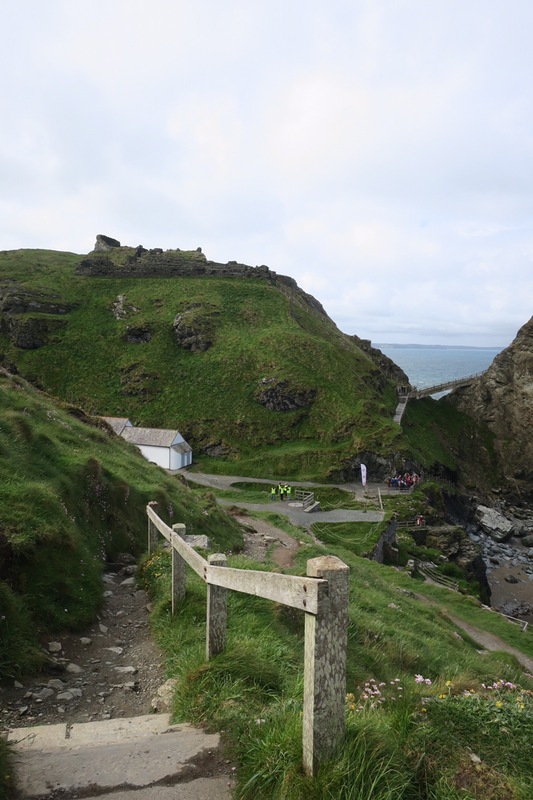 The highlight of the day was most definitely crossing the Cornwall/Devon county border at Marsland Mouth. 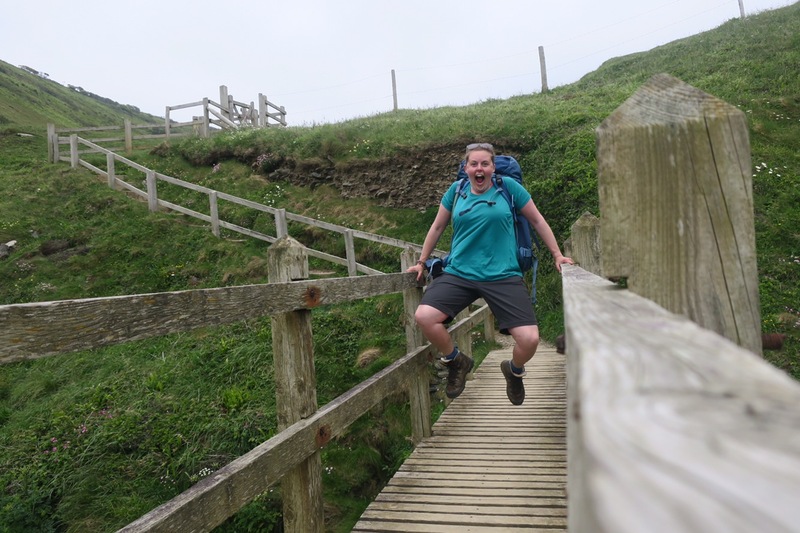 Celebratory leap – with the backpack on! I slogged on for the last few miles to the hostel at Elmscott, the weather and clouds started to close in but lifted again just in time for a nice sunny evening. The two volunteer YHA wardens, Janice and Sue warmly welcomed me into what was an old school and even offered me a glass of wine to have with my dinner! Awoke to a heavy sea fog and it was gusty so as opposed to heading out early as I had intended, I gave it an hour to lift. It didn’t but off I set anyhow. 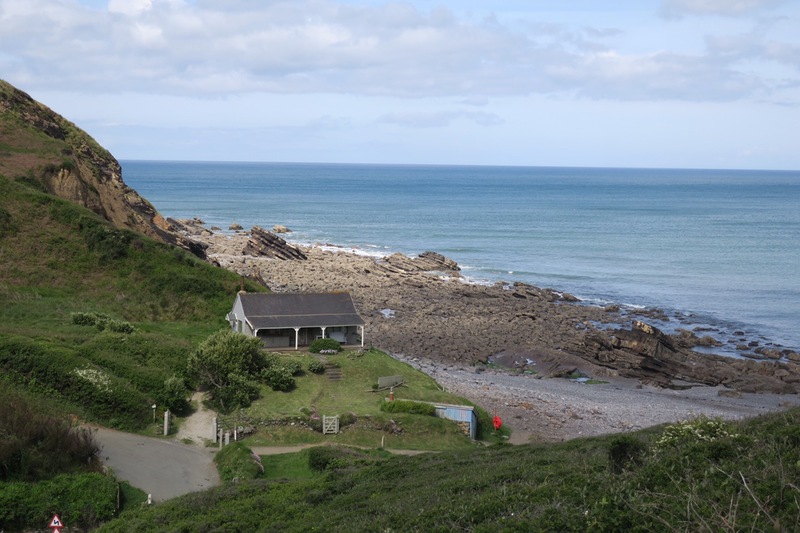 I knew there was a scarcity of accommodation so a wild camp was in the offing and was feeling confident having done the first one with R & J. I took roads and tracks up to Hartland Point from which Lundy is apparently visible…pah! 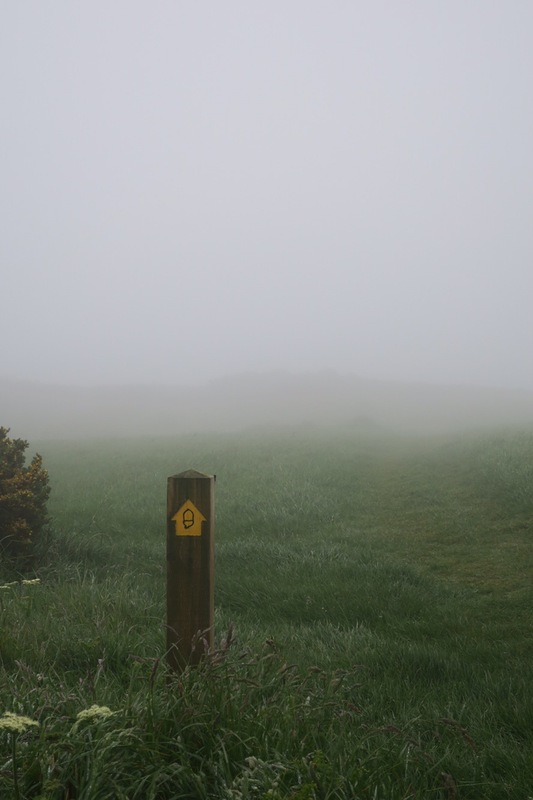 I couldn’t even see the sea at the bottom of the cliff, let alone the lighthouse perched at the end of the promontory or Lundy. I walked through Brownsham Woods towards Clovelly and enjoyed the change of scenery; for the first time I wasn’t on either the coast path nor a field boundary. 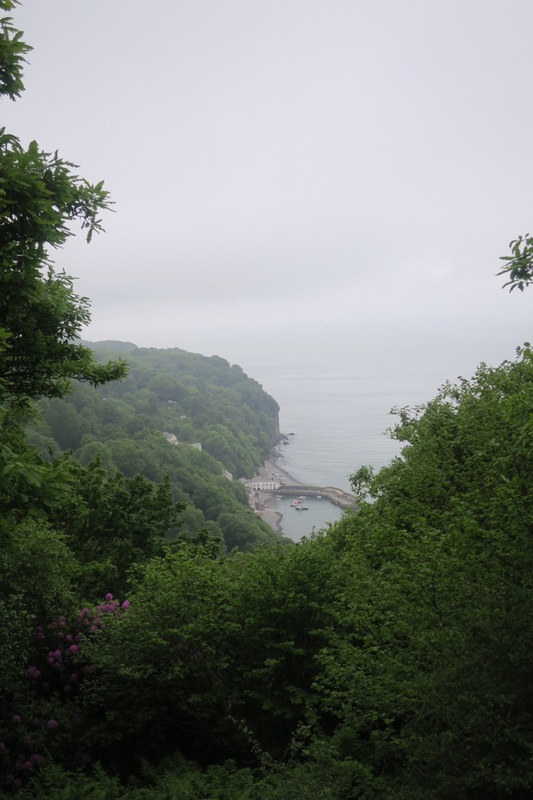 I arrived at the top of Clovelly village at just after 5 and as everything would be shutting up at the end of the day I didn’t go down the steep slopes to the harbour and instead pushed on. The woods continued and continued and continued. 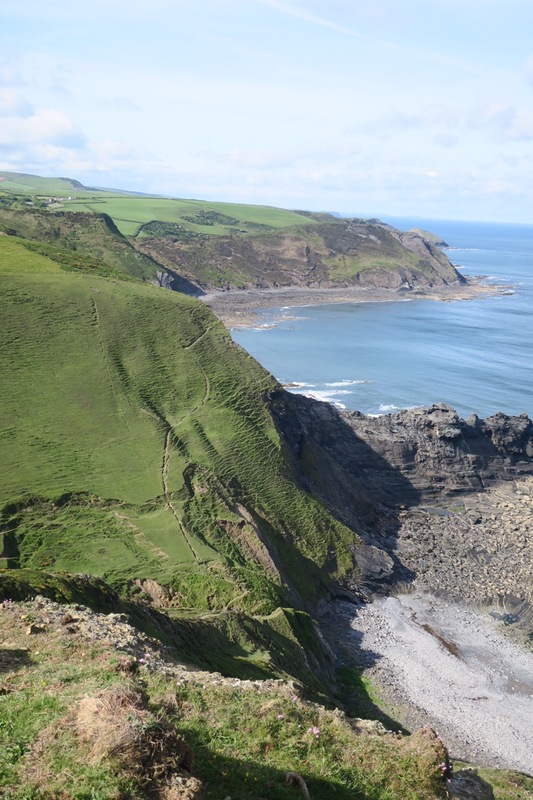 The coast path hadn’t be shrouded by trees at all since Lands End – why now? I dislike woods at dusk and really don’t like camping in woods so needed to get out to find a spot. I stopped in the corner of a field and cooked up some dinner then cracked on. I could see from the map that in a couple more miles the trees cleared. I was getting frustrated and it was getting dark, especially in the shade of the trees, it was humid and the little bitey bugs started to come out and, well, bite me! Finally just beyond Peppercombe beach the trees cleared and I found a spot on the path so I pitched up and went to bed. At 17miles it had been my longest day so far and was quite foot tired. Unfortunately the long grass was a haven for bugs (which I hadn’t considered when I was tired and needed to pitch my tent) and I woke with a tick biting me and more in/around the tent, plus many other weird and wonderful insects. As soon as I set off, just 50meters along the path I passed another tent but they were yet to rise so I passed by quietly and left the inhabitant to their lie in. It was another foggy and humid morning, the vegetation was waist high and very damp and so my trousers and boots got soggy very quickly. I was breaking through cobwebs all the way along the path which tickled/irritated my arms and face, plus I roused the many bugs as a wafted past the plants (have I mentioned the annoying bugs?!) who I could feel biting me. It was hot work but I had run out of water so was thirsty and I was tired from yesterday’s long effort. Also, I didn’t really know where I was headed, I didn’t have a plan for the next few days. All of these factors combined and led me to have my first meltdown! I shouted expletives at the many bugs and had a little cry. Once I had calmed down, I got a 3G signal and found that there was a Premier Inn in Bideford so I booked in! Now I had a plan, I was going to stay a couple of nights in order to do some proper laundry, eat some fresh food, get myself and gear clean and dry, and research the next section of the walk; Barnstaple to Knighton. The route to the hotel happened to go via a lovely pub where I inhaled a burger and beer in a beautiful garden and then all was right with the world. Reading about the events in Manchester certainly put my ‘hardship’ into perspective. Well done Lucy! Walking in the dark woods does not sound fun. Enjoy a nice hot bath at the premier inn. hey Lucy… quite the adventure. You are in my part of the world now… family from Bideford and Appledore. I am wondering if the next part will be along the Tarka trail from Bideford, or down into Appledore to take the little ferry boat across to Instow. The Seagate pub in Appledore is great (as is the whole village of my childhood). If you are there, say hello to my Mum and Dad in the Churchyard or give them a wave from Instow if you go that way. You didn’t miss much on the last day of the Premiership. We’ll give you a wave from Wembley Saturday evening. Bideford has treated me well; scooped me up, spivved me up and spat me back out lovely and clean! I’m going to be taking the tarka trail up to Barnstaple then across to Exmoor (no more SWCP). Shame I’m missing out on the pub…I’m trying to collect the all! Enjoy the match, although I expect we’ll get thrashed. I HATE bugs and I think you coped brilliantly both with them and the woods – and all the other irritations! You thoroughly deserved your night in the Premier Inn. I look forward to reading about your Devon adventures. Go girl!